The Shape property of a curved Mass Element will affect how it reacts to the FacetDev and FacetMax settings. 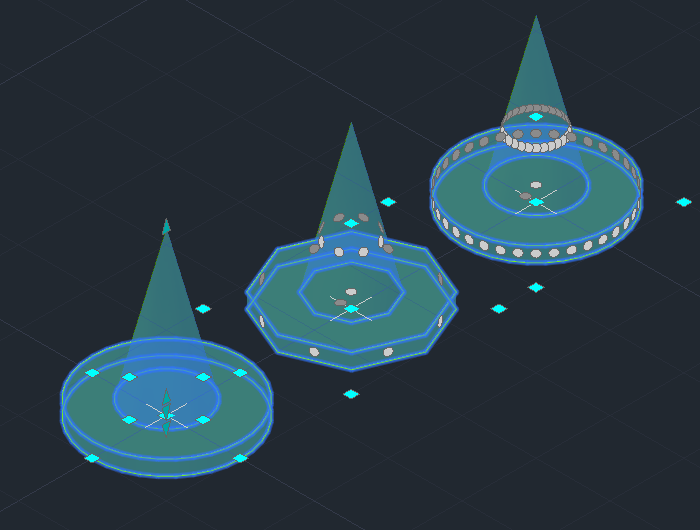 Any of the standard shapes that involve a curve, Arch, Barrel Vault, Cone, Cylinder, Dome, Doric and Sphere, will be initially placed based on the settings of FacetDev and FacetMax, and will update when changes to the FacetDev value would result in a different number of segments. A change to the value of FacetMax will not result in a change to the faceting of existing Mass Elements, even if it would cause a lesser or greater number of segments. The effect of a change to FacetMax on existing objects will be seen only if the value of FacetDev is subsequently changed by an amount sufficient to result in a different number of facets. Use of the Boolean tools to create Unions, Subtractions or Intersections of two or more Mass Elements that results in a shape that cannot be created by extruding a Profile placed in the X-Y plane in which the first object was created. Use of the AecMassElementConvert command to convert an AEC object or an AutoCAD 3D Solid to a Mass Element. The Convert to Mass Element tool on the out-of-the-box Massing palette (in the Design tool palette group, in the US Imperial content, and, likely other content as well) runs this command. You can also access this command by selecting an AutoCAD 3D Solid, right clicking and chosing Convert to > Mass Element from the context menu. Use of the ConvertMEToFFME command to convert an AutoCAD 3D Solid or a standard-shape Mass Element to a Freeform Mass Element. For standard-shape Mass Elements, this command can be invoked by selecting the Mass Element, right clicking and choosing Convert to > Freeform Mass Element on the context menu. NOTE: If you right click on one of the standard-shape tools on the Massing tool palette, and choose Apply Tool Properties to > Mass Element, the ConvertMEToFFME command will be run, but the 3D Solid or Mass Element will be converted into a Mass Element with the standard shape of the tool which was right-clicked. In the images below, all three things started from the same source. At the lower left, there are the original objects: a Cylinder base and a Cone on top. In the middle, with FacetDev set to 20, with the Cylinder selected, Boolean > Union was selected from the right-click context menu, and then the Cone was chosen. The same operation was performed on the source objects in the upper right, but with FacetDev set to 0.5. In the top image, FaceDev is set to 0.5, and you can see that the facets on the Freeform Mass Element in the upper right match those of the Cylinder and Cone in the lower left, while the Freeform Mass Element in the middle retains the faceting that was current when it was created. For comparison, FacetDev is set to 20 in the lower image, and you can see that the faceting of the middle Freeform Mass Element matches that of the Cylinder and Cone in the lower left, while the faceting of the Freeform Mass Element in the upper right remains as it was at the time it was created.